The collection of American glass is displayed as types and not as a time line. 61A Amber pitcher with lionhead decoration below handle. 40A and 41A Pair of pattern molded wines. The Fry glass in our collection is the heat resistant borosilicate glass made by H. C. Fry Glass Company in Rochester, PA 1902-1930. This company made complete dinner sets, tea sets and a large variety of heat-resistant oven glassware from 1916 to 1930 under a license from the Corning Glass Works. 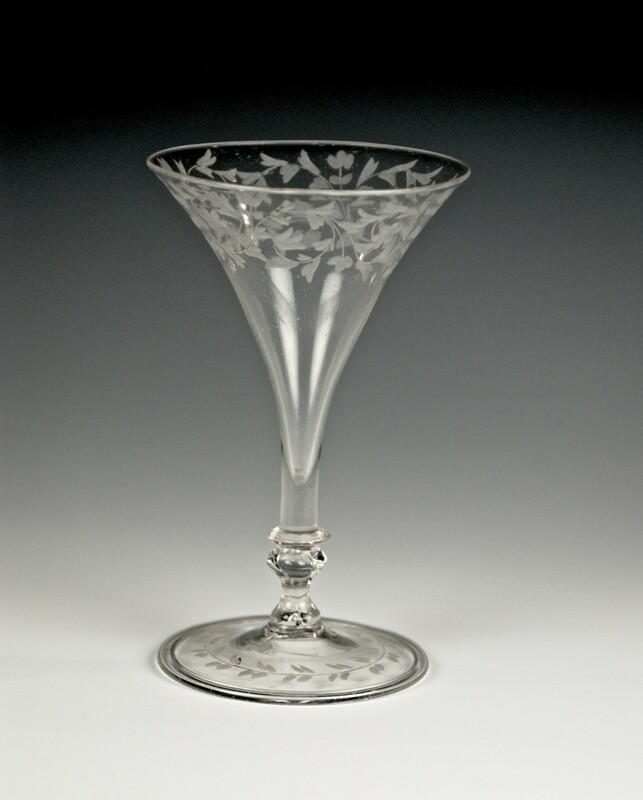 Remarks:A bohemian engraved wineglass with trumpet shaped bowl on a short solid stem with a merese and small knob on a folded and engraved foot. The bowl on this tall Roemer is large and plain. The open stem is decorated with raspberry prunts and connected to a spiral foot made from a glass thread. This glass is very to similar 31E which is slightly smaller 15.5 cm. First half of 1st century AD. Western Roman Empire, probably Cologne. H= 22.4 cm. D max= 13.8 cm. D rim= 4.5 cm. D base= 7.2 cm. Weight 281 gr. Classification: Isings 1957: Form 52a. Condition: Intact. Incrustation on exterior and interior. Iridescence and some pitting. Technique: Free blown, tooled. Handle applied. Description: Transparent yellowish amber glass. Large jug. Triangular hollow rim, somewhat irregularly folded out, down, and up. Tall tubular neck with slight upward taper and constriction at its base. Near spherical body. Open pushed-in base ring with slightly concave underside and no pontil mark. Angular handle with four wide-set ribs applied to shoulder, drawn upvertically and attached at right angle to neck just below the rim. Excess glass folded back and up against underside of rim, creating a small open loop on top of the handle. 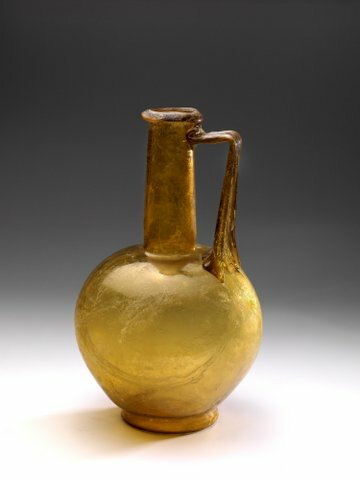 Remarks: Narrow necked jugs are among the earliest luxury Roman glass tableware, imitating pottery jugs. The elegant handles were made with great care and precision. 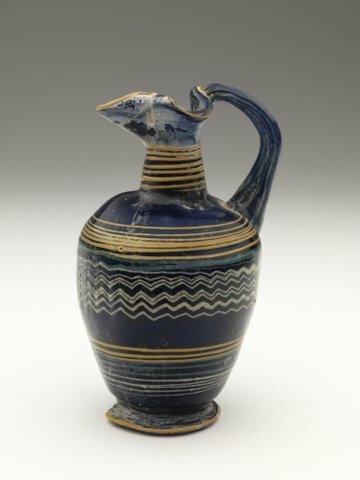 These jugs were commonly made with an open pushed-in base ring, although closed also occurred. Provenance: The David and Jennifer Giles Collection, London, UK, 2007. Published: Groen & Rossum 2011, Thermenmuseum Heerlen (NL), p. 58. Exhibited:Thermenmuseum Heerlen (NL), Romeins Glas uit Particulier Bezit, 29 April – 28 August 2011, No. 063. References: Stern 2001, Ernesto Wolf Collection, No. 30. Sotheby’s 7 July 1994, The Benzian Collection, No. 153. 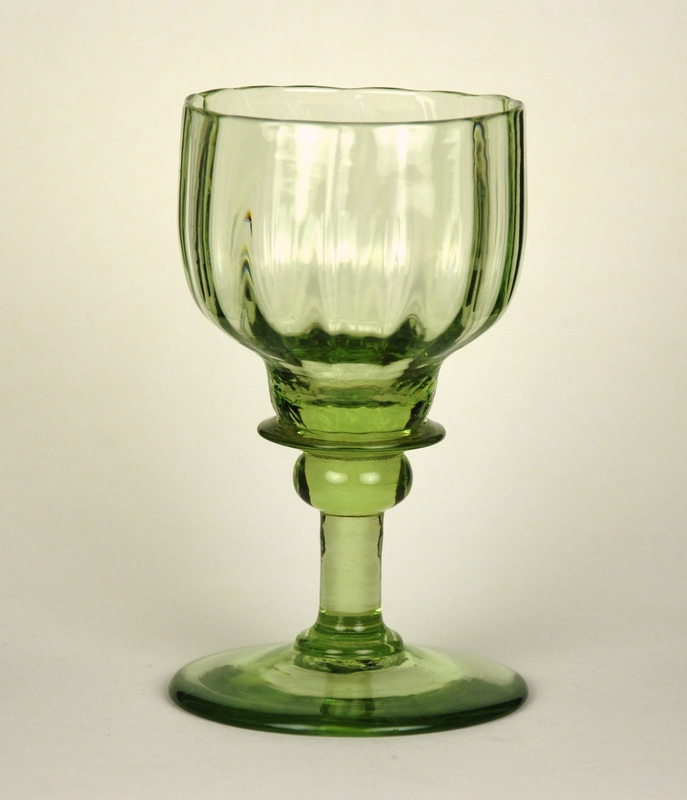 This contemporary light green wine glass has elements of both early Roemers and English stem ware of the 18th Century. It was probably made in Europe or England. Mid 4th – early 3rd century BC. Probably Italian or Eastern Mediterranean. H= 11.3 cm. D max= 6.0 cm. D base= 3.8 cm. Weight 121 gr. Classification: Grose 1989: Class II: AF. Form II:3. Condition: Intact. Glossy appearance. Some light weathering. Technique: Core formed. Rim tooled, handle and pad-foot applied. Marvered and unmarvered threads applied. Description: Translucent cobalt blue ground with opaque yellow, opaque white and opaque turquoise decoration. Broad trefoil rim. Tall cylindrical neck with slight taper upward. Almost right-angled junction with rounded shoulder. Ovoid body with distinct convex curve. Broad circular pad-base with slightly concave underside and rounded edge. A vertical, ribbed strap handle arches to the top of the rim. Unmarvered opaque yellow threads wound around the edge of rim and pad-base and spirally in horizontal lines around the neck. On the shoulder a marvered opaque yellow thread wound spirally in six till seven revolutions. Below two marvered opaque turquoise horizontal lines, partly combed into a zigzag pattern. Eight marvered opaque white spirally wound threads at the middle of the body, tooled into a zigzag pattern. On lower body three bands of marvered spiral lines in opaque yellow, turquoise and white. Faint vertical ribbing on upper body due to tooling. Provenance: Breitbart Collection. The Cyrus Collection of Core Form Glass. Published: Groen & Rossum 2011, Romeins Glas uit Particulier Bezit, p. 17. Sotheby’s 9 December 2003, No. 89. Safani Gallery 1995, The Cyrus Collection of Core Form Glass, P16. Sotheby’s 20 June 1990, The Breitbart Collection, No. 56. Reference: Grose 1989, Toledo Museum, No. 146. Stern 1994, Ernesto Wolf Collection, No. 53. Arveiller-Dulong 2000, Louvre Museum, No. 145. Saldern 1980, Hans Cohn Collection, Nos. 7 and 8. 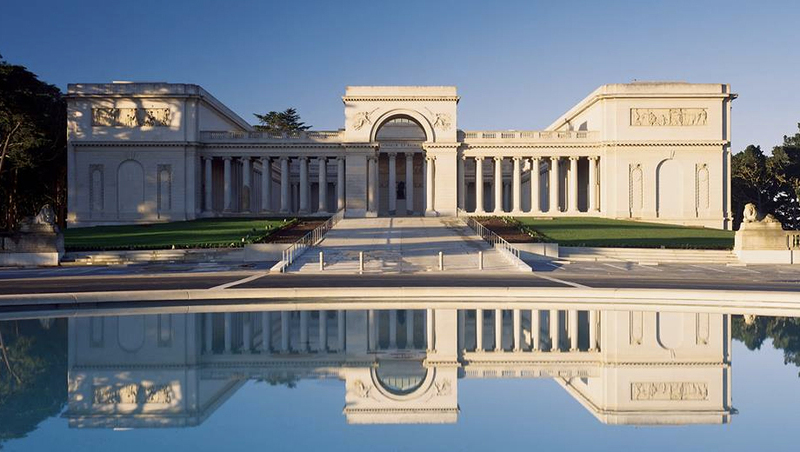 The Legion of Honor is part of the Fine Arts Museums of San Francisco. The name is used both for the museum collection and for the building in which it is housed. The collection spanning more than 6,000 years of ancient and European art houses the Achenbach Foundation for Graphic Arts in a neoclassical building overlooking Lincoln Park and the Golden Gate Bridge. They have a fine glass collection of about 3,400 objects of which 114 are ancient Roman and Islamic. This bottle is olive green; the globular body has a flattened and indented base. The tall neck has a slight constriction where it joins the body and is decorated with a ruffled collar. The form may be from the crossover time between Roman and Islamic periods. 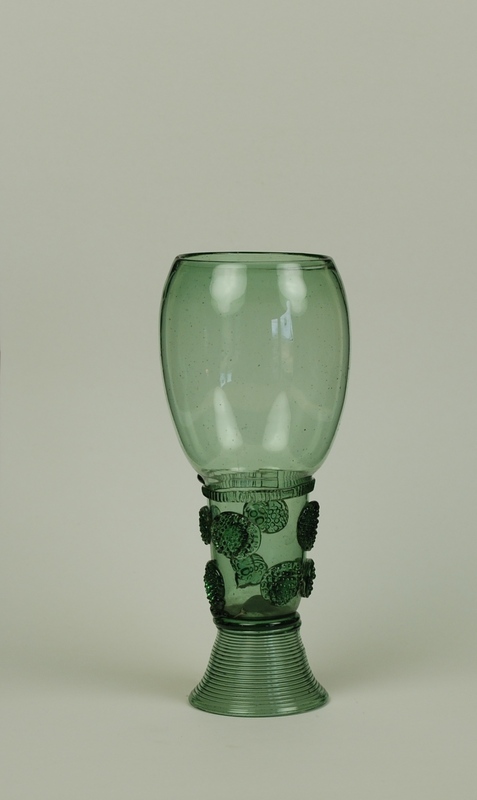 This is a rare clear glass goblet with small handles for suspending rings, originally six only one remaining. Milled thread applied to the center with wavy band decoration. The knopped stem enclosing an elongated tear. It was probably made in the Low Countries or Germany. 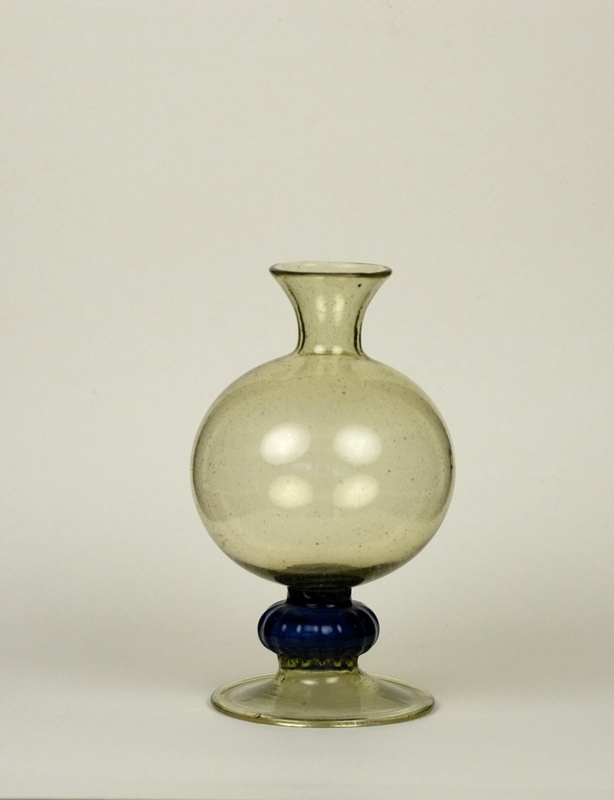 This is a small Spanish ovoid glass bottle, of yellow tint over a blue melon knop and a folded conical foot. There is no known parallel to this exact shape in the literature.